This mini Lawn Fawn stamp set was a must have for two reasons! First, I love puns and second, my daughter visited Peru last summer and has fun stories of getting up close and personal to some llamas and alpacas. When I saw the CAS Challenge on SCS this morning, I knew I wanted to ink up this fun alpaca and include it on a tag. The scarf - made in India - was a purchase during a fun sale while on a cruise ship last year. Everything in the sale was $10, so I immediately headed to the scarves - knowing they would be great gifts and lightweight to pack! On to the tag creation...I smooshed my 2 favorite distress inks (Peacock Feathers and Twisted Citron) on some TH watercolor paper. I then dropped some water over the paper (by tapping a paint brush) after I dried the inks with my heat gun. The droplets lightly "bleached" out a splatter effect. 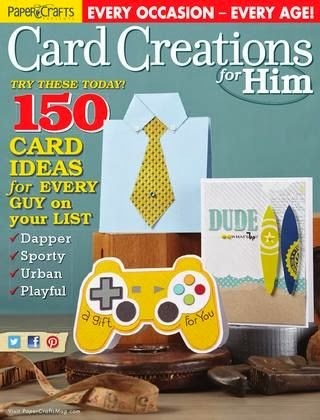 The image was stamped on X-Press It Blending Card, colored with Copics, then die cut. The white banner was cut using MFT's Stitched Fishtail Flags STAX Die-Namics. 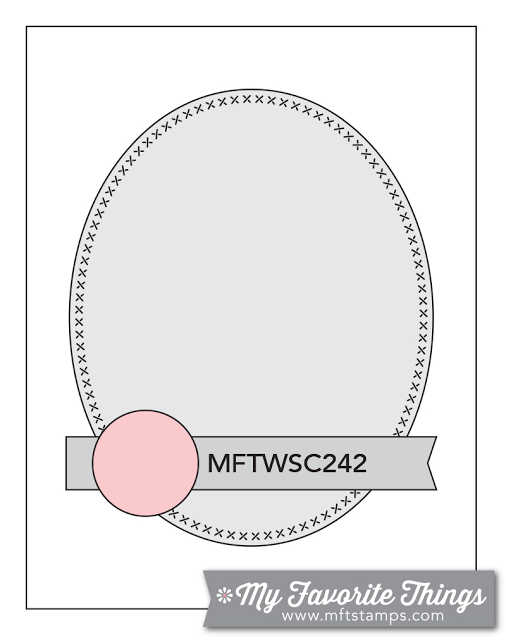 The tag itself is one of my favorite die cuts by Reverse Confetti. Copics: BG32, BG15, E000, E01, E40, E42. OILY DIY RECIPE FOR THE DAY: Make your own ALL PURPOSE CLEANER and you'll be living much healthier without the toxic chemicals found in so many ready made products! Place soap and oils into your spray bottle and swirl to mix. Slowly add water to the top of the bottle and give it a shake! Use to spray counters, sinks, bathrooms, etc. Other oil options would be thieves and orange, purification, citrus fresh or eucalyptus. Thanks for stopping by...I always love to read your comments! It's tall and skinny card week with the last Mojo Monday Challenge of the month! When I saw the vertical line of circles in the sketch, I knew I wanted to use balloons to create a birthday card. 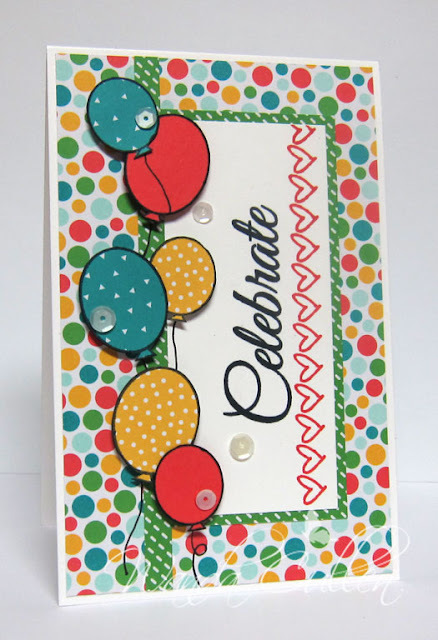 You can never have too many birthday cards in your stash! I stamped and fussy cut the balloon images from Verve's Birthday Bash set then hand drew the strings. The sentiment is from Moments Remembered and the heart border is from Borderline. Don't you just love how you can mix and match the different Verve sets?! For perfect positioning of the sentiment and border, I used my trusty MISTI - the Most Incredible Stamp Tool Invented! 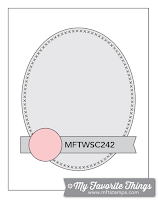 My card dimensions are 3 1/2" wide x 5 1/2". 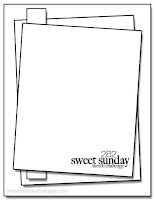 PAPER: Cherry on Top Designer Series paper stack by SU; Watermelon Wonder (SU), White. Need more inspiration? See what the rest of the mojomakers have created by clicking on their blog links below. News Flash!! 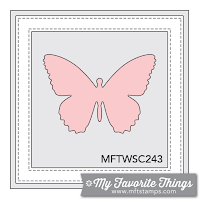 Dina Kowal just posted her genius solution for stamping with a MISTI using stamps on wooden blocks! Check out her video HERE. Now I'm keeping a look out for some Duplo blocks at a second hand store! 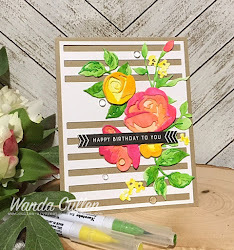 I'm combining 2 challenges on the MFT Challenge and Inspiration blog: Color Challenge #28 and Wednesday Sketch Challenge #243. 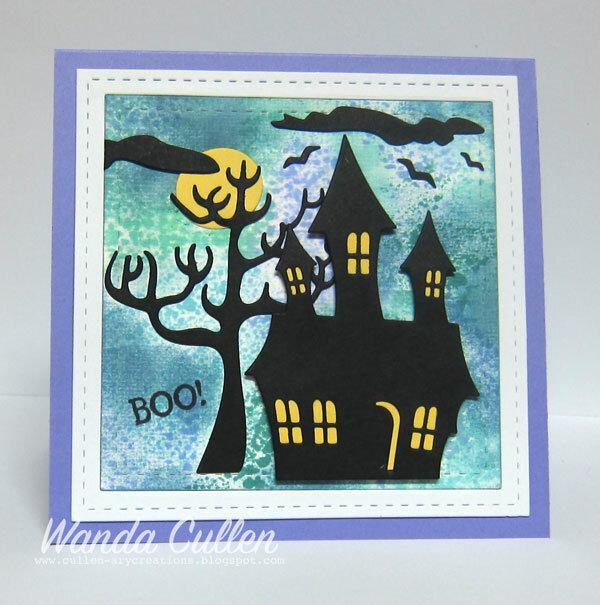 When I saw the 4 colors, I knew it would work for a spooky sky by smooshing distress inks in the background. I used Cracked Pistachio, Shaded Lilac, Tumbled Glass, Stormy Sky and Evergreen Bough. The card base is 5" square and I really went back in time with using a long time retired piece of Lavender Lace (SU) cardstock. The sentiment is from MFT's Primitive Pumpkins set - one of my fave fall stamp sets. The rest of the elements are using MFT's Spooky House Die-Namics. So ironic...after I completed this card, our son, DIL and grand-daughter stopped by the house and we built a camp fire in the fire pit. We built the fire and took Quinn on a golf cart ride as the sun was setting, then we ate s'mores while the full moon was rising! Full moon on the card...full moon outdoors! LOVE these non-humid, slightly cool evenings! I decided to add the bokeh effect to my smooshed distress ink background. 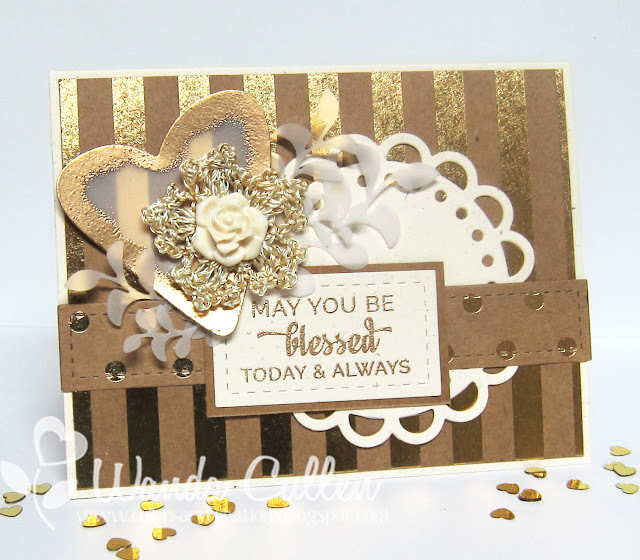 Some looped string and die cut stars and sentiment made this card come together quickly. Actually, it took me far longer to come up with the idea that it did to create it (isn't that often the way?!). I thought this would work to give to a co-worker who is leaving or retiring. 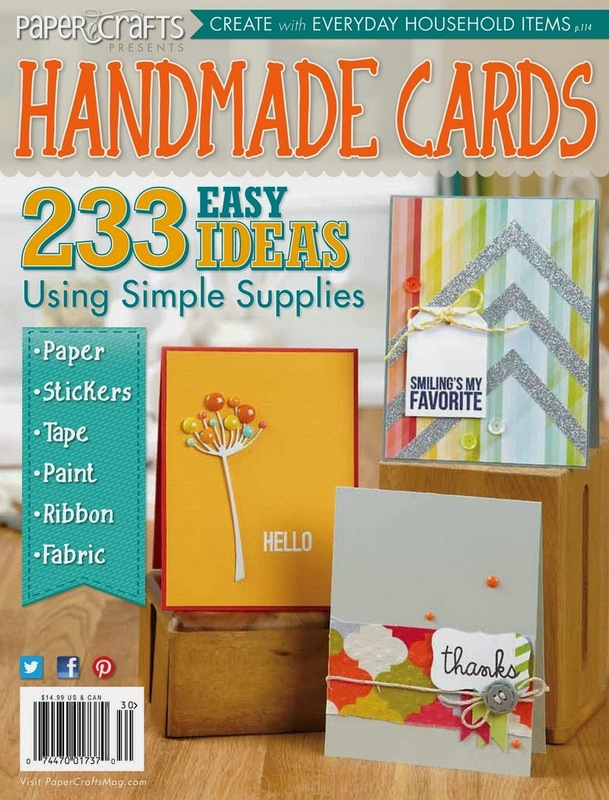 STAMPS: Sending and Wishing by Simon Says Stamps. PAPER: Tim Holtz watercolor CS, White (PTI), Regal Rose, Tempting Turquoise, Black. INK: Worn Lipstick, Broken China, Tumbled Glass distress inks; Versafine Onyx Black; ColorBox Frost White pigment ink. 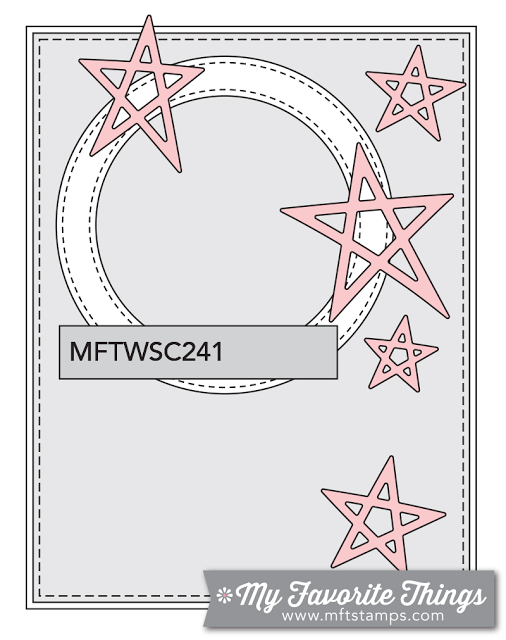 ACCESSORIES: Stitched rectangle and stars dies by Lil' Inker Designs; Wishing die by Simon Says Stamp; Avery Elle sequins; White thread. 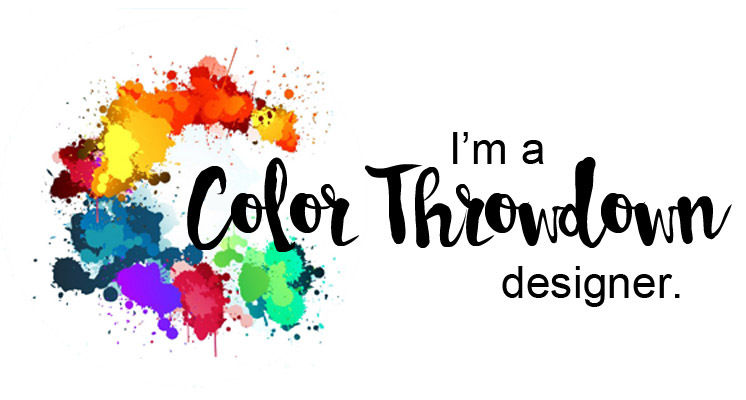 Be sure and check out the rest of the design team's inspiration cards by clicking on their blog links below...or... you can go to the Color Throwdown blog to see the team's cards and to get the details on how to play along. 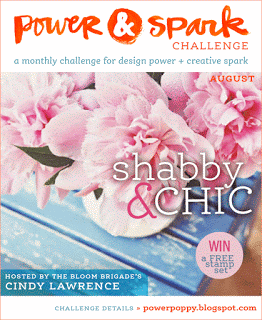 Check out Karen Barber's classy Color Challenge on SCS today! Metallic gold and vanilla. I started with this striped vellum from SU and die cut the edge using a stitched border Die-Namics by MFT. The Circle Scribbles dies and the Wet Paint sentiment die and sentiment stamp are all by Papertrey Ink. Would you believe I still have some of the old SU cording from many years ago and am so happy to see it (along with silver) back in the Christmas catalog that goes live for ordering on September 1st. So, now I'm ready for the next golden (50th) anniversary that might come my way! OILY TIP FOR THE DAY: Lemon essential oil came to my rescue recently when I had a large price tag sticker that had a ton of adhesive residue when I tried to remove it. I remembered hearing that lemon oil was a much healthier alternative than the obnoxious odorous fumes of most adhesive removers. I used 2 drops and took a tissue and it wiped off like buttah! :-) So quick and easy! 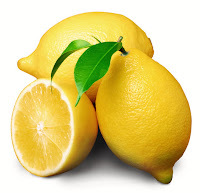 A friendly reminder...if you're using it on plastic, be sure and clean off the lemon oil with a little soap and water so the acid doesn't react with the plastic. There's a great deal on getting the Premium Starter Kit by Young Living through the end of August ($10 off the regular price for new members)! If you have any questions how you can get these oils and a diffuser of your choice in your life, please let me know. This is a quick 3 challenges in 1 card! I smooshed some Peacock Feathers and Squeezed Lemonade distress inks on a panel - die cut using a stitched rectangle die by Lil' Inker Designs. 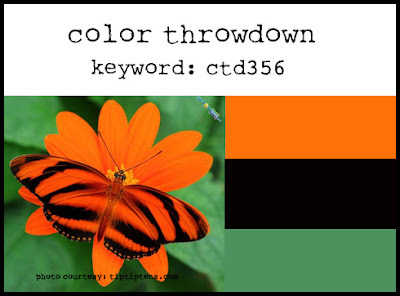 Digi image is from A Day For Daisies and sentiment is a word die from PTI's Wet Paint die set. Labels: CAS, SCS TLC, Tag...You're It! Good Monday everyone! It's Mojo Monday Challenge day and I've got a rustic wedding card for my interpretation of Julee's great sketch! My last visit to Michael's landed this Vintage Glam paper pad and coordinating tiny doily embellishments (Recollections) in my cart! 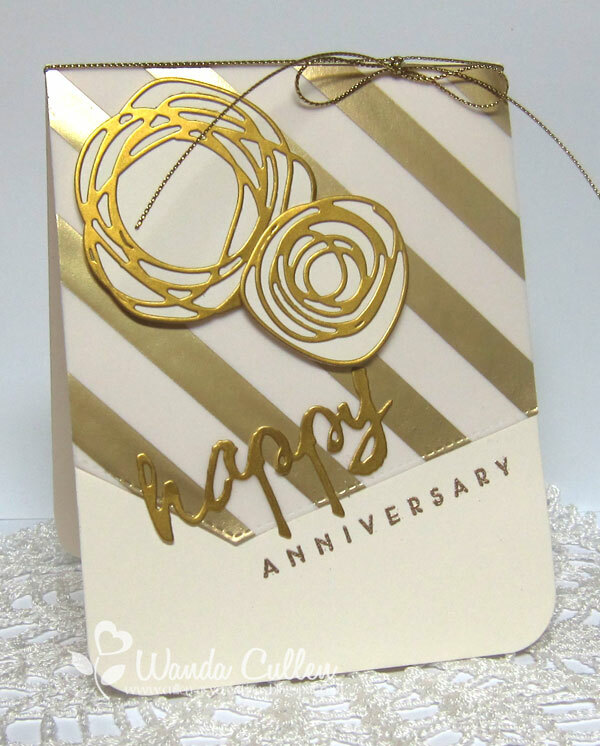 When our housekeeper at work announced that she would be having a rustic country wedding, somehow I thought kraft, cream and gold would be a good combo for a card for the newlyweds. I sponged some Versamark ink on the edges of a vellum heart cut with Verve's Jotted Heart die and embossed with Queen's Gold embossing powder by Ranger. The leaves were cut using Verve's Sprightly Sprigs dies. The scalloped doily is one of MFT's Die-Namics. I seem to always gravitate to using Stitched Rectangle dies (Lil' Inker Designs) on nearly all my creations lately. Just much easier than dealing with my temperamental sewing machine - lol! The rose embellishment is from SU's Vintage Flowers collection. 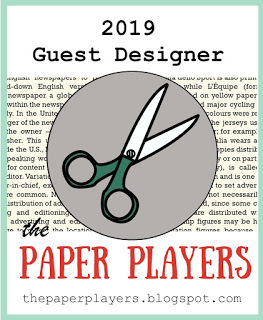 I'm straying from my usual paper crafting posts to share a newly found passion! Young Living essential oils! 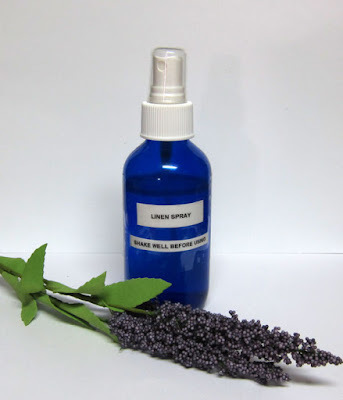 It's always bothered me a lot to spray on the high levels of chemicals in most commercial bug sprays, so one of the first things on my oily wish list was to get the ingredients to make my own safe spray. I also struggle with insomnia and wanted an alternative to help me sleep - other than pills. When a local friend posted how much oils helped her on FB, it peaked my interest. I met with her and another oiler who shared their experience and the rest is history! My photo above shows a lipstick or nail polish caddy that I found at TJ Maxx and it works perfectly for storing my glass roller bottles. I keep a Young Living EO file on Pinterest and have it full of many different "recipes" and helpful tips. You can refer to it here: https://www.pinterest.com/cullenwr/young-living-essential-oils/. Bug/Tick Repellent: Palo Santo (the only EO that works for ticks!) 10 drops, Peppermint 5 drops, Purification 20 drops. Fill glass bottle with non-alcohol Witch Hazel or distilled water (or 1/2 of each). My project this week was to mix up a LINEN SPRAY using 30 drops lavender, 1/3 cup water and 1 tablespoon witch hazel in a glass spray bottle. Before using, it's important to shake it well. I also want to share my SLEEPY BLEND roller bottle recipe: 10 drops Lavender, 10 drops Cedarwood, 10 drops Orange in a 10ml roller. Fill the rest with carrier oil (I like to use Young Living's V-6). 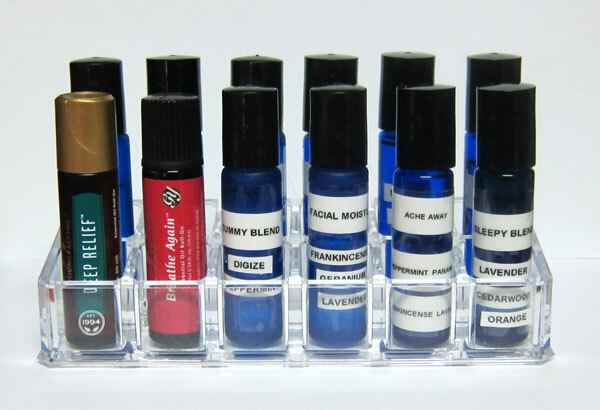 I also love to diffuse oils on a daily basis. Not only does it smell good, but it's acting as a mini humidifier! I have many, many different combinations that I diffuse and today it's a newly released oil called Northern Lights Black Spruce. LOVE it! That's all the oily news for today. I'll be adding more of my fave oil uses from time to time and I'll be happy to answer any questions if you are interested in learning how to add them to your life to enhance wellness! 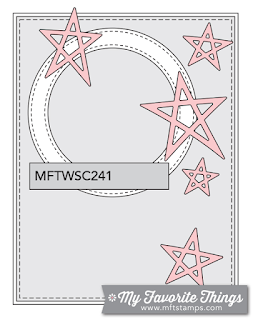 MFT Wednesday Sketch Challenge and a gift card of $20 is mine to spend! Woohoo! Now to wait for my 1st choice stamp set to get back in stock. 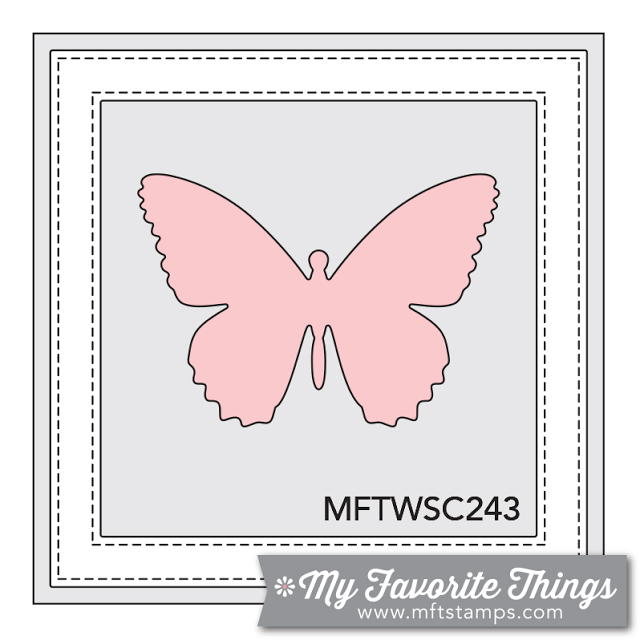 The only stamp used was the boy sentiment from MFT's Beautiful Baby set. Here we are...another Color Throwdown challenge is up and running and you are going to LOVE the colors chosen by our hostess Broni! 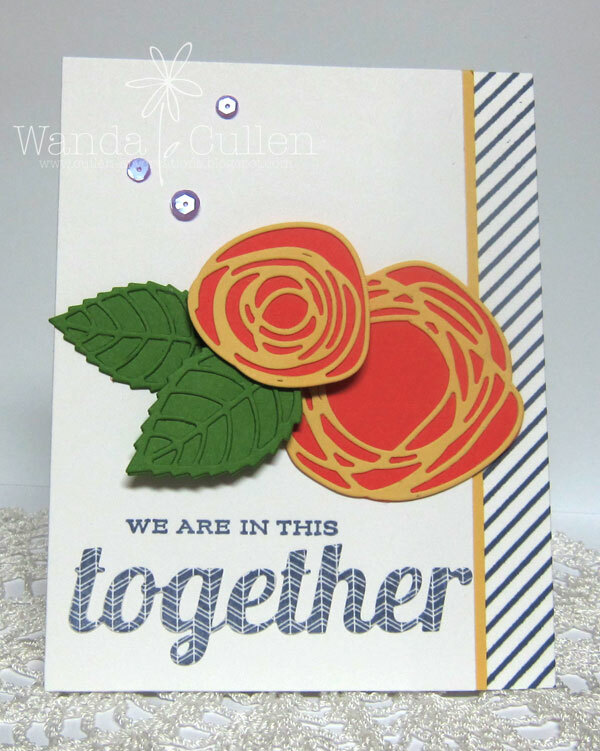 I'm hanging on to summer for dear life, so a floral creation won out over a possible pumpkin card! 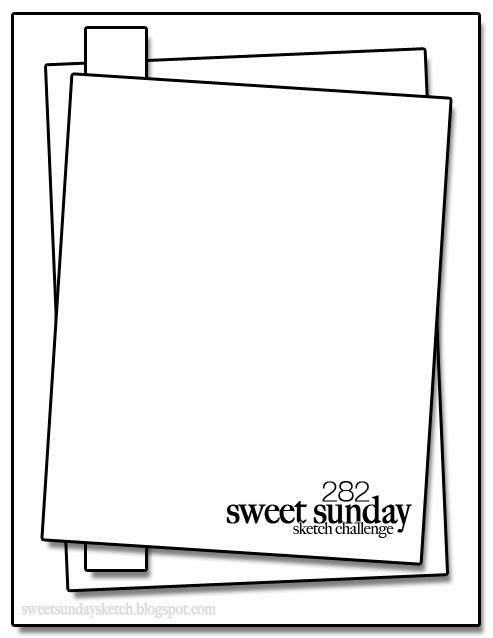 I used Karen Giron's Sweet Sunday Sketch for the layout (don't you love the large, wide open panel that is so perfect to use large elements?!). 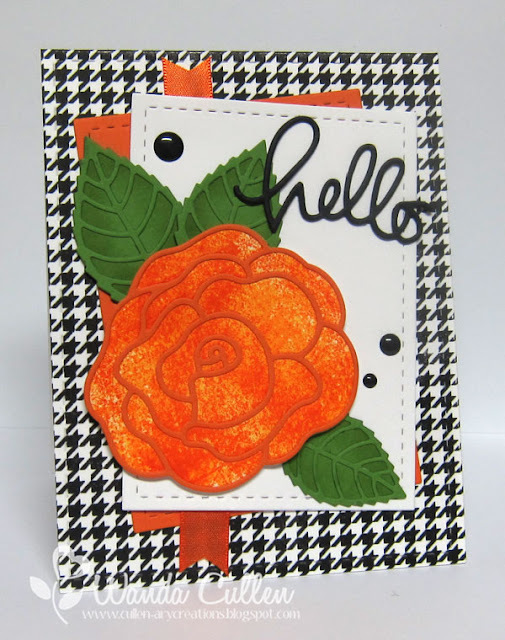 Love the large houndstooth background stamp recently released by My Favorite Things and I definitely was thankful for my MISTI tool because it took 3 inkings before I got the area covered well with black ink! I sponged the background leaf dies on the edges with Lucky Limeade (SU) ink. The rose base was created by smooshing a small amount of Mustard Seed and a larger amount of Spiced Marmalade distress inks on acetate, spritzing with water then smooshing a panel of white CS over the ink. The small hello die is by Simon Says Stamp and the stitched rectangle dies are by Lil' Inker Designs. Ribbon is Orange Zest satin by PTI. Congratulations to Yapha Mason who is our guest star stamper this week! Be sure and stop by her blog HERE. STAMPS: Wonderful Words: Together (PTI); Diagonal Stripe background stamp by MFT. PAPER: So Saffron, Calypso Coral, White, Green (?) from my scrap pile. ACCESSORIES: Circle Scribbles and Together dies by PTI, Layered Leaves Die-Namics by MFT, Sequins by Avery Elle. Hi blog friends! Thought I'd share the steps I used to create a personalized blog header! 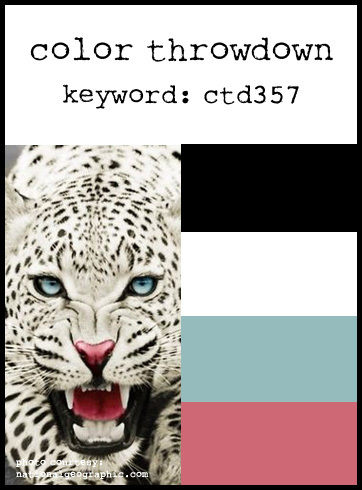 I'm no computer geek by a long shot and didn't want to pay the high prices to have someone else design a blog header for me. Since I'm on a roll lately with the smooshed background, I decided to start with that technique and then adjust the colors and size with Photoshop software. STEP #1: I smooshed some distress inks (Peacock Feathers, Salty Ocean, Broken China) onto a 8 1/2" x 11" piece of recycled acetate. I spritzed it a couple of times with water, then lay down a panel of Strathmore Bristol paper (11" x 5"). I picked it up and placed portions of the paper back into the ink until I got a suitable looking background. 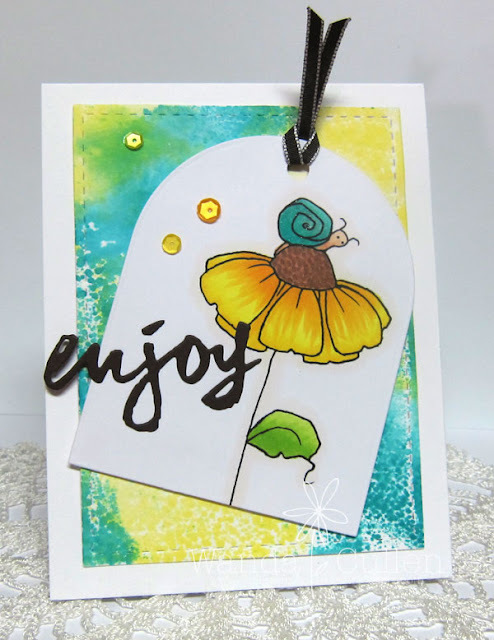 I sponged the 3 ink colors on the die cut butterfly (Cheery Lynn Designs) then dried everything using my heat gun. STEP #2: Using the Tim Holtz Bubble stencil, I applied Wendi Vecchi's Crackled Texture Paste to the background. Not having much patience to wait on it to air dry, I speeded the process up with my heat gun. STEP #3: I popped the butterfly with some foam tape and added a rose embellishment with a large glue dot. 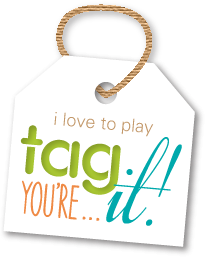 The banner tag (die by Reverse Confetti) was die cut from PTI's Aqua Mist cardstock. STEP #4: The last step was taking a photo of the finished panel and editing through Photo Shop. I added the text then set the width at 900 pixels and the height automatically adjusts itself. 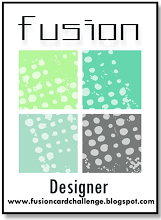 Blogger had this light gray bokeh look background in the customized template selection that I thought worked perfectly and echoed the dotted stencil! So, there you have it...a pretty simple and easy header! Are you ready for another great Mojo Monday sketch challenge? 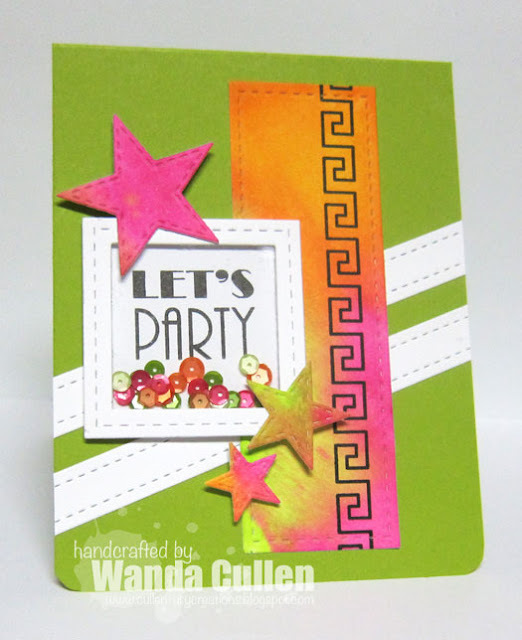 Get your shades on for this post because I went with some bold neon colors for this party card! Need more inspiration? Head on over to see what the rest of the mojomakers have created by clicking on their blog links below. It's been awhile since I've played along with the MFT Wednesday Sketch Challenge, but I was eager to play with some newly released dies so procrastination reigns with emptying kitchen cabinets for an upcoming renovation! I smooshed 5 distress ink colors on my craft mat, spritzed with water, then dabbed the watercolor cardstock panel into the inks. 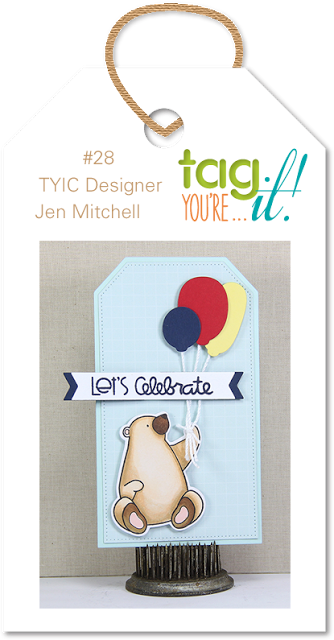 After drying with a heat gun, the die cut pieces were adhered and it turned out to be a very quick and easy card to create! PAPER: Pacific Point, White (SU); Tim Holtz watercolor CS. INK: Squeezed Lemonade, Mustard Seed, Spiced Marmalade, Twisted Citron, Salty Ocean - TH distress inks. 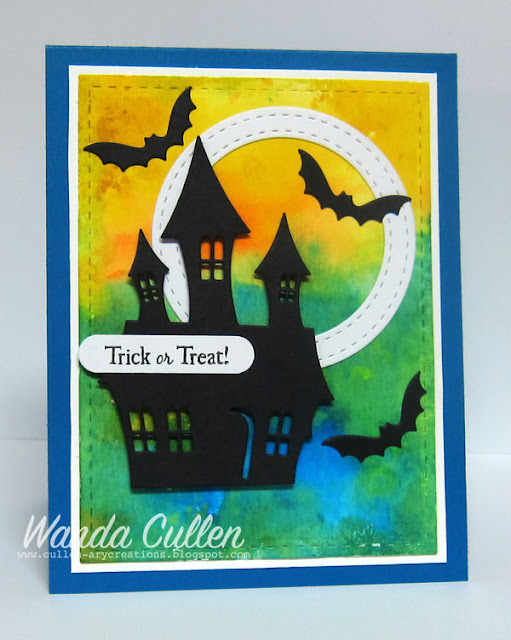 ACCESSORIES: Spooky House Die-Namics by MFT, Word window punch by SU, Stitched circle and rectangle dies by Lil' Inker Designs. 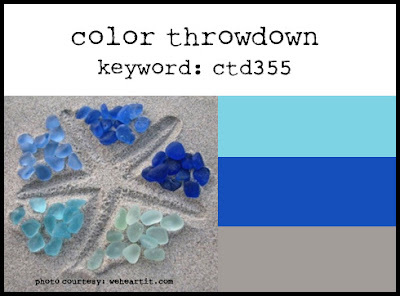 Can you believe another week has rolled by and it's time for another Color Throwdown challenge?! Summer is slipping away far too quickly! I love the gorgeous sea glass photo that Bar chose for our inspiration, but my brain was in 'freeze frame' mode when I first saw the colors. Whenever I'm up against a wall with zero ideas, I go to my fave inspiration spot: Pinterest! 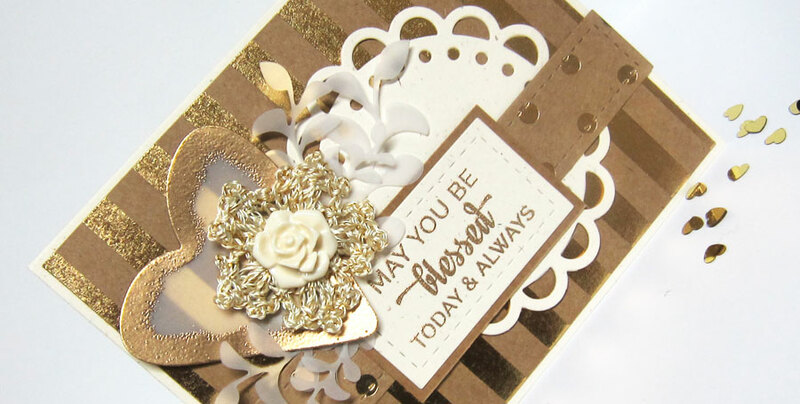 I had pinned this card by Kristina Werner which inspired me to create this sympathy card. If you click on the link, you'll see she has a great tutorial for this watercolor technique. Sadly, we learned of the death of a church family member Sunday morning that we've known for many years. It wasn't a surprise...in fact, his family considers it a blessing that his suffering has come to an end. So, I knew I wanted to make a sympathy card for them. I used the "smooshing" technique by applying two different distress inks - Peacock Feathers and the new Blueprint Sketch - on my craft mat. I spritzed with water then blotted color onto some TH watercolor cardstock. After drying it, I dripped some water spots over the panel which "bleaches" out some of the color. I was doing a happy dance at the end and really loving these colors! PAPER: Smoky Slate (SU), White, Black. INK: Peacock Feathers, Blueprint Sketch (TH distress inks); Versamark. 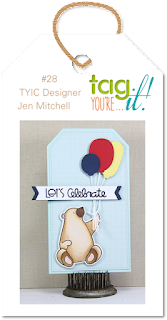 ACCESSORIES: Sending die by Simon Says Stamp; White detailed embossing powder; Stitched dies by Lil' Inker Designs. 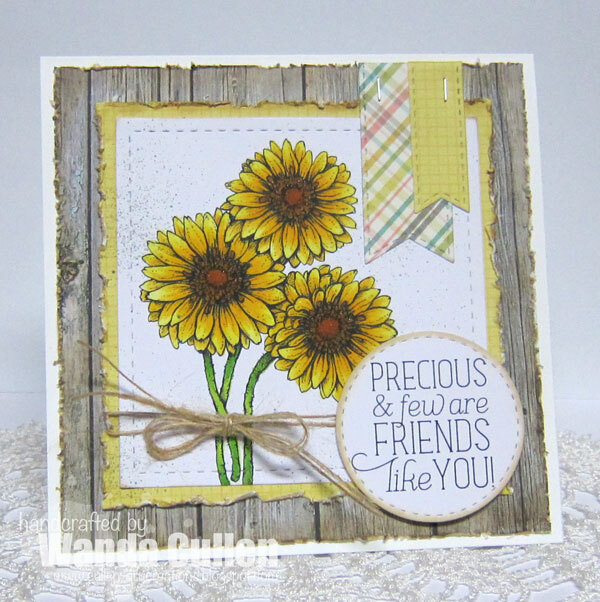 Congratulations to Jenny Lane of The Other Fickle Pixie - our guest star stamper this week! Remember...YOU could be our next guest stamper if you play along with the challenge!